Getting around has nothing to do with polluting. Charging stations refer to what are essentially gas stations for electric vehicles. The goal for charging stations is to allow electric vehicles extended ranges and simple recharging without interrupting the owner's daily life more than going to the gas station every 300 miles does. Since range is probably viewed as the largest stumbling block in the adoption of electric vehicles, this section is an important part of the overall transportation solution. There are a couple of different methods for doing this that are currently being discussed. The first is simply to plug into what is essentially a wall socket to recharge. The second solution is to have the batteries in electric cars be removable. The first solution is the one that most manufacturers are defaulting to, where the battery packs are a part of the vehicle. 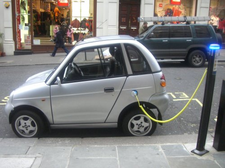 In this situation, there are likely to be a number of charging locations around cities from homes to parking lots to the side of streets that you can pay to have your car plugged into and charging while you are at home, at work, or shopping. This infrastructure would also need to include side of the highway rapid charging systems that can recharge a vehicle in a matter of minutes as a part of a long trip. With this option, until this rapid charging technology is figured out, we will need to rely on gasoline engines supplementing the electric engines in plug-in hybrid electric vehicles to extend range. The second option involves a type of plug-in hybrid electric vehicles (PHEVs) that combine the first option with removable battery packs . Rather than needing to rapidly recharge battery packs this type of system would work by removing the battery from the vehicle and making it a part of the infrastructure, much in the way gasoline refueling works . In this situation, you wouldn't actually own the battery in your car, you would have a subscription to a battery swap service that would swap out the battery in a matter of minutes every time it died, much in the same way you go to a gas station when your fuel tank is low. They would then give you a full battery and recharge yours over the course of the next few hours before giving it to another customer. You could also plug your car in and recharge the battery you have, however.